Sharing helps family and caregivers stay organized and coordinated—so everyone can have access to the same information. People sharing a CareZone profile can view, add, and edit all the information in all modules (e.g. Medications, Journal, Calendar, etc)—but only for that profile. As new CareZone profiles are added in the future, you can choose if you want to share that profile with others (or not). Invite individuals to share through your CareZone mobile app or the CareZone.com website. You'll need to invite each person separately for every CareZone profile you want to share. If the person you've invited accepts, we'll notify you and anyone else sharing access. The newly added person can view, add, and edit everything—except personal profile data. When any information changes in the CareZone profile, anyone sharing will have access to the updates. The person who creates a CareZone profile can remove previously invited helpers anytime. While in the CareZone app, tap the HOME module (bottom left). Tap the circular profile icon to open the profile menu (top left). Tap the name of the profile you want to share. Tap the PROFILE tab (top right). Scroll towards the bottom of the screen and look for "SHARING". Tap the blue plus (+) button (bottom right). Tap Someone else from the menu list. Enter the email address of the person you want to share with. Tap the SEND INVITATION button. Your shared-with can now check their email inbox and accept your invite. Tap the blue Invite others button. Visit the CareZone.com website from your desktop computer or mobile web browser (not the mobile app). Click the profile name of the person you want to share (far left column). Click the + Share button (just below "Shared with" in the far right column). Enter the email address of the person you want to share the profile with. Click the Send Invitation email button. An email invitation will be sent to the email address provided. 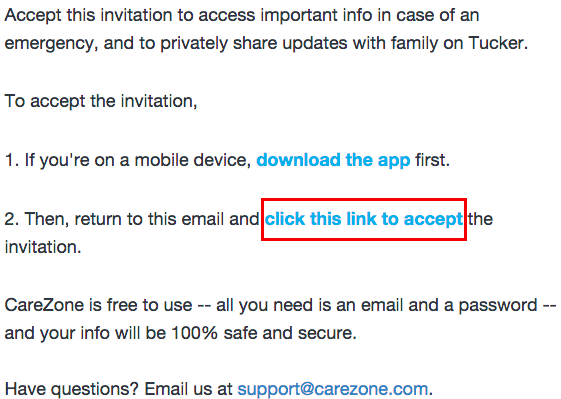 To accept the invitation, click the second link provided in the email (see example below). Sign in to your CareZone account from the invitation link using the same registered email and password you used to sign up. Have questions? Email us at support@carezone.com and we'll help you out!